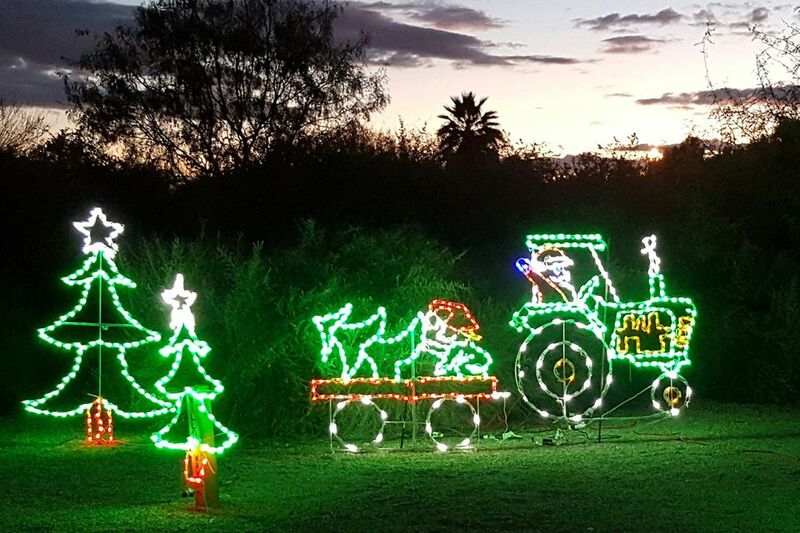 The Town of Gilbert in the East Valley of the Greater Phoenix area celebrates the holiday season with luminarias, holiday entertainment, and a focus on helping others annually in early December. The event is free to the public. The Riparian Preserve at Water Ranch in Gilbert is a unique park with a lake and ponds filled with reclaimed water. In the 1980s the Town of Gilbert committed to reusing its wastewater and created an innovative habitat which has educational and recreational uses. 70 acres are used for water recharge basins that are filled on a rotating basis with treated wastewater. Then the water percolates back down into the aquifer. A lake is filled with reclaimed water and is used as an urban fishing lake with the Arizona Game and Fish Department overseeing it. Each December the Riparian Preserve welcomes people to evenings of strolling the candle-lit trail at Water Ranch Lake. During Riparian After Dark, hundreds of luminarias and colorful light displays, as well as school choirs, carolers, and other live holiday entertainment entertain visitors. Light refreshments are available to purchase. The trails are ADA accessible. You can bring a dog on a leash to walk with you. Each night of the event is dedicated to a local non-profit agency and donations are sought to help those in need. You can park at the Southeast Regional Library with entrances on both Greenfield Road and Guadalupe Road. The event takes place at the Riparian Preserve at Water Ranch. Directions: Take US 60 to the Greenfield Road Exit. South on Greenfield and drive south to Guadalupe. The entrance to the parking lot is east of Greenfield on Guadalupe. Dates are set in early December and the event is open from 5:30 p.m. to 9 p.m. Watch the Gilbert website for the current dates. Find other events like tree lightings, holiday lights, festivals, holiday music and entertainment with the Christmas Holidays Guide for Greater Phoenix. Major Christmas lights events include lighting displays at the Phoenix Zoo, the amazing Christmas at The Princess in Scottsdale, and the month-long Glendale Glitters. There's so much to see and do in Phoenix during December. The month makes for a great vacation to a warm climate. In addition to holiday lights, you'll enjoy art festivals, outdoor concerts, and pro sports events across the Valley of the Sun.